*** Ashley Laminates Ltd *** . . 1955 to 1972 - My Story .. 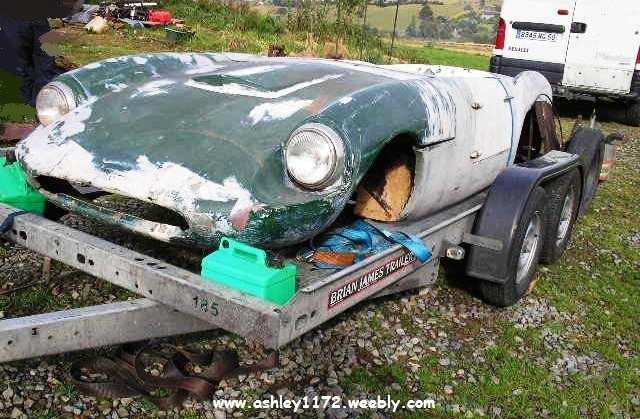 This rather sad bodyshell was once a proud 1964 Ashley 1172, registration No. KMM 116B, but it has seen better days. I live in the South of France and I've bought an 1172 Ashley registered KMM 116B. The body is at the moment in repair to build a new mould. 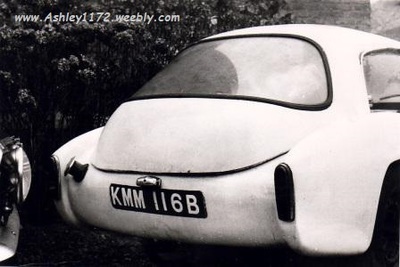 The year of original registration is 1964. 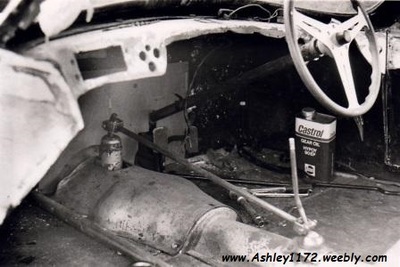 I replied thanking him for his email and was pleased that he had informed me that he had the Ashley 1172. 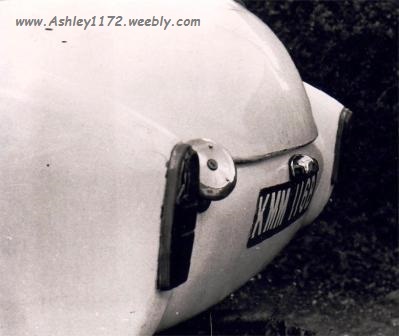 I knew of this car by its registration number only, I had no photos or history of the car apart from knowing that it was registered at a Middlesex County Council office in 1964. The DVLA records show that it was last registered in UK in 1997 as shown below also that it had White bodywork not Green. Guillaume later emailed me the photo of the Ashley above, it's as he purchased it, I am hoping that I will get further updates of the restoration and some history of the past 50 years of the Ashley. hopefully previous owners may see this page and email their stories about the car whether in UK or France to me, so I can update Guillaume and all readers to this site. 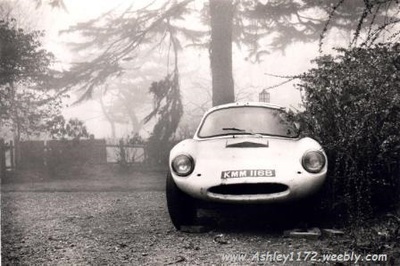 I owned an Ashley KMM 116B back in the 1970s, White when I had it but had I think been Dark Green previously. Full Aquaplane tuned engine, head, inlet manifold, twin carbs. Ballamy split front axle, rear axle/diff, Ballamy wheels; boxed chassis. Sold as 'an ongoing restoration' it was probably broken for the Ballamy/Aquaplane engine parts. The new owner was rebuilding a Dellow and that was definitely his priority. 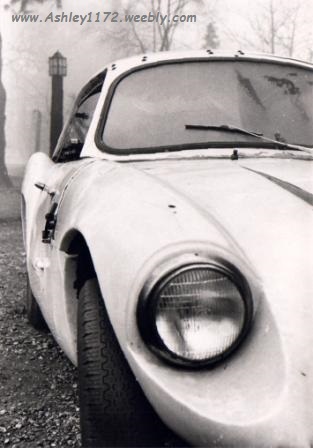 I replied that day asking if he had any more details and copies of any photo's he may have of the car back in the 1970's, also mentioning that the car was in France being restored as far as I knew. Also that I would contact Guillaume to see how it was going and pass on the details that Barrie had supplied. 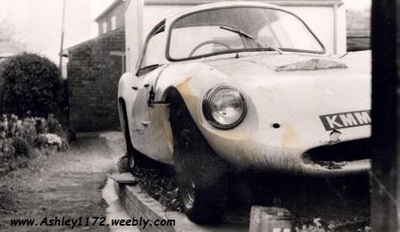 I emailed Guillaume and fortunately he had not changed his email address, he also still has his Ashley 1172, sadly not finished at this time due mainly to family commitments. Barrie also got back to me with further details about his time as owner and also photo's of the Ashley when he had it back in the 1970's. As far as I can remember I bought the car from its previous owner in South East London (maybe Penge area? ), wasn't a runner and we towed it home. At the time I worked on Cars and Car Conversions magazine based in Croydon, the car was advertised in the classified ads' it was local to where we lived, I was looking for a 'project' and this seemed to fit the bill, pretty sure I paid £25 for it. Can't for the life of me remember what it was registered as on the logbook but it was described as a Sportiva in the ad'. On reflection, it was in fact a 1172 with a hard top. I have a few photographs of it as purchased but no others. There were no side windows or frames, no dash, no seats, no interior, the body in poor condition cosmetically with damage to the nose. Mechanically complete and not in too bad order. I overhauled the cable brakes, decoked with new Aquaplane head and copper head gasket from Aquaplane (who were still in business). Overhauled the carbs and the cooling system. Started to remove the umpteen coats of paint, so thick one could chip it off without damaging the gel coat. However, a change of job and the imminent arrival of our first child (now forty) meant that other priorities took place. Didn't advertise it and can't remember who bought it from me, they simply turned up one day and asked about it. Well, that fills in some of the space between the 1960's to present, perhaps someone else will see the car as it was in the 1970's and remember that it had passed through their hands too.